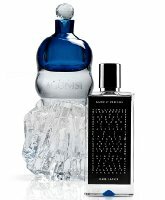 A beautifully balanced and captivating fragrance inspired by the Sapphire stone with its remarkable hardness and strenght - yet refined, details and light elegance. The power, beauty and durabililty of the Sapphire translated into fragrance. The notes feature violet leaves, black pepper, cumin, coriander, ginger, bergamot, rehan, peach, raspberry, rose, iris, jasmine, geranium, carrot, carnation, orchid, heliotrope, cinnamon, oud, patchouli, gaiac, cistus, vanilla, copaiba, olibanum, nagarmotha and tonka bean. Agonist Dark Saphir is available in 50 ml Eau de Parfum, in the art glass edition (above left, €1200) or spray (above right, €125). Oh man, I’m going to have to Google. Rehan, copaiba, nagarmotha? What the heck are those notes? Adding: I suspect “rehan” is a translation issue? But not sure. Sounds lovely. Haven’t been at all interested in any other Agonist releases… hmm. It’s hard, at this point, to get me interested in *any* new niche line. But I did think the Agonist scents I tried were really well done.